So your clients. I have mentioned this before. You make all that effort to get a customer or a client, so why do you not make a lot of effort to keep them once you have got them? Most people put all this effort into marketing. They advertise, they go to exhibition, they send out direct mail, do ads online, you build a website and put out content, you get people in, you get them through your funnel. You get them there and then they purchase. And that’s great. Because they become a customer. And all that work suddenly pays off. And then you’re off to go get another one. But there are statistics. I’ll just make it up because I am sure everyone does, but it is 80 percent easier to keep an existing client than to go find a new one. You know the 80-20 rule. Everything works at in 80’s and 20’s, but that is probably about right. Because people have go through to become a purchaser. First of all, they have to actually be interested or in a position to buy your product, or it has to be the right time and they have to be your ideal client. So that accounts out a massive portion of the population right away. Then they have to get to know you. Then they have to get to like you. And then they have to get to trust you, before they’ll dip their hand in their pocket, pull out their credit card or that pen and check book or even that cash. And then they buy from you. It’s taken a lot for them to get to that point where they trust you. Now once they are at that point of trust, you want to reward them for their trust, to confirm to them, that they have made the right decision. That they are not an idiot. They haven’t gambled. You are not a spammer. They are not worried about their credit card getting stolen, all that kind of malarkey. They have made the right decision. So it’s more than just sending them an email, automated email from an e-commerce store, that says thank you for your purchase, your order will be ba,ba,ba,ba,ba. No, you need to make an effort. Now, everyone that buys from ours, goes on to our mailing list and we send them nice stuff. But how about phoning them up? Now how many clients do you have? At mine, Fire Protection Online, we get loads every day, loads. It would be impossible to ring them all up. But we do call a percentage. So is it difficult for you to call your clients? To talk to them? To thank them? To first of all check that they are happy with that they got, with the service, with the product? Or are you scared? Are you thinking, “No, I don’t want to hear, I don’t want to hear that they didn’t like it?” Why wouldn’t they like it? What’s wrong with your product? What’s wrong with your service? Huh? Get some confidence. Come on. Man up. You’re good at this. You are an expert. You are great. You actually run an entire business. People pay you their money. You are good. Speak to them. We sometimes ring our new customer to just find out if you are happy. If we delivered, on what you hoped?” Most of us are polite. Most of us are kind. Actually probably don’t ring me, ring anyone else, when I say most of us. But most of us are polite. We will say, what we want people to hear. That is them being polite. Because they don’t want to say, “Get lost. I don’t want it, don’t waste my time.” They are polite. That’s the way we’re built, we are nice. We have plain note cards in our Fire Protection office and when any of our staff, if they deal with a client or with a supplier or with an anyone, and that person slightly stands out with what’s polite, whatever, whatever the reason. They don’t need a reason. They can pick up one of those cards and hand write a thank you or a note to that person. Put in their envelope, put it in a post, And that is that. We don’t need to know about it. They just do it. Imagine that. Who does that especially when you are buying from an online company? It surprises people. Then once in a blue moon, why don’t you have a little event? A little talk, a little seminar, get together with another couple of businesses if you need or you have to. Invite them to your premises. Another excuse for getting in touch. Like with banks — you know when banks gives opening offers to the people but they don’t give them to their existing customer. Doesn’t that make you think, “That’s annoying.” Don’t let that happen, ring them up again, excuse for talking to them, send them a letter. Really easy. How about that? 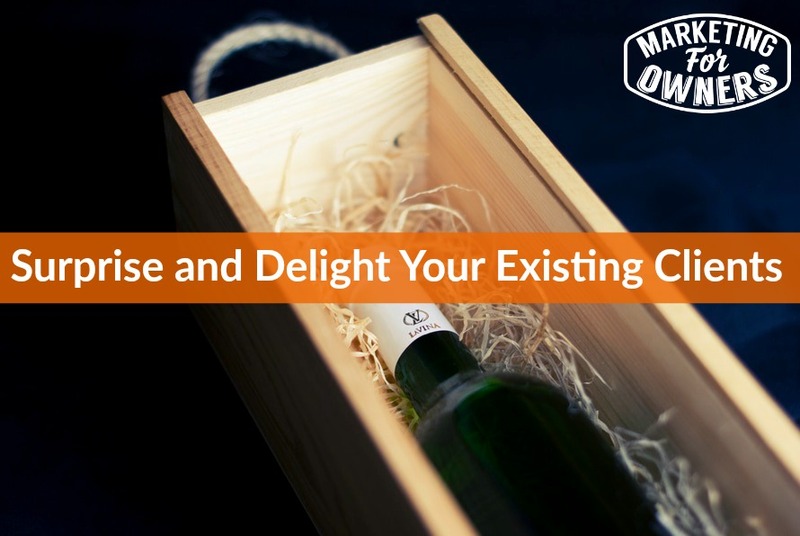 t does not have to be, don’t start thinking boxes of chocolates, bottles of champagnes, bottles of wine. Don’t forget, not everybody drinks. So things like that. Also in businesses, lot of big businesses, not allowed to take gifts, and bribes. You know could be seen as possible bribery to a purchasing department. Things like that. But a little packet of love hearts. How about that? That would make it memorable, wouldn’t it? A little packet of wine gums. Do you have those wine gums everywhere else? No alcohol in it I think. Honestly, I have eaten millions of them, never got me drunk. But things like this. All these ideas are just to stand out. And say thank you to your clients. And make you memorable because then they’ll come back for more. Then they’ll trust you more. And then they become, from a purchaser, they move on to become a repeat purchaser and then they become a regular purchaser. Do you know anyone else who would appreciate this kind of thing, anyone else I can mention it to? Pass on, get them some sort of special, the same special offer you had, so they get rewarded too. Exactly. And then they become your preacher. And then, when they become your preacher, they start doing you’re selling for you. And then they put the new people into your funnel and it goes round and round and then you have a perpetual sales cycle. It perpetuates. You’ve just hit 5, 6 and 7 of the 7 P’s. Fantastic. Again, if you want to know more, go to that www.freemarketingcourse.co, it will explain a lot of this. Okay I am going to mention it again, by the way, at some point in time. Just warning you. So it’s Monday. Book for the Week. I have been reading, “On Writing”. It is by Stephen King. Yes. That Stephen King. You know ‘Carrie’, ‘Green Mile’, ‘The Shining’. Other stuff. . But to be honest I am just going to admit, I have never read a Stephen King novel in my life. But I have seen the films, some of them. I don’t think I have even seen the “Carrie” but I’ve seen lots of the others, it’s great. Obviously the guy is quite successful. But the book is good. So it’s an auto-biography, which is interesting in itself. But it also gives us also some writing lessons. And from someone who’s sold millions and made gazillions of dollars. Its someone you want to listen to. 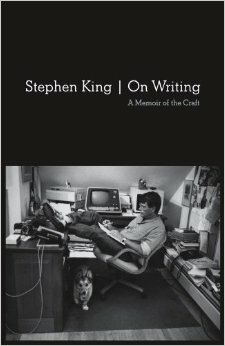 So “On Writing”, Stephen King. Go read it. I’ll be back tomorrow.